The Joslyn Castle is excited to present our 4th annual Spring Lecture Series! This year, we’re focusing on all things Organic Gardening! How can we be better environmental stewards in our own backyards? Expert gardeners will lead discussions about starting, maintaining, and flourishing your organic garden. Join us Monday evenings in April for this FREE community event. No tickets or RSVP's are required! Goodwill donations will be accepted toward the Joslyn Castle gardens. Doors open at 6:15pm, programs begin at 6:30pm. April 8th - Organic Pest Control with City Sprouts Omaha: Squash bugs, cucumber beetles and cabbage moths, OH MY! Learn how to manage these (and many more!) pests without causing harm to other beneficial insects, your community or yourself by using the practices of Integrated Pest Management, which include: identification and monitoring of insects, pest exclusion mechanisms, organically approved treatments and ways to promote the health of beneficial and predatory insects in your garden. We'll cover the best ways to ensure a bountiful harvest free of pest damage...all while having minimal or no impact on the delicate ecosystem of your home garden! April 15th - Organic Container Gardens with the Nebraska Extension: Small garden or no garden at all? You can still grow a wide variety of fruits and vegetables in containers on your porch, patio, balcony, or even windowsill or grow a wide variety of crops in even the smallest garden. From fruit trees and crops suited for compact growing in containers, to hiding produce in attractive planters or landscape beds, or even growing microgreens on the countertop, John will share a variety of inspiring techniques and best practices to make the most of your growing space. Tonight's lecture is presented in partnership with the Nebraska Science Festival. April 22nd - Organic Soil with Benson Plant Rescue: Our lecture is titled "Nature’s Way to Organic Soil Improvement" led by Judy Navon and Dr. D of Benson Plant Rescue. Benson Plant Rescue has a mission of growing community, not just plants. 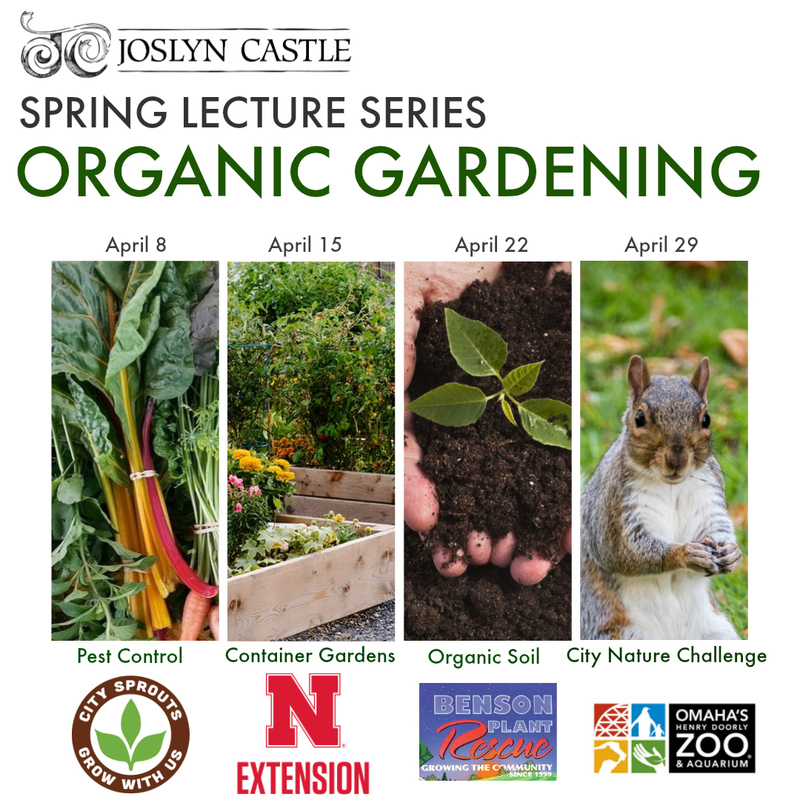 April 29th - City Natural Challenge with the Omaha Zoo: This final chapter of the series takes place outdoors on the Joslyn Castle grounds. Join the Omaha-Metro Area in competing against more than 60 cities across the globe for the title of "the world's most biodiverse city" during this unique experience. As a community, we will explore the great outdoors on the 5.5 acre grounds in search of as many plant and animal species as we can spot and using mobile devices, we will record our findings. Educators from the Omaha Zoo will lead a brief informational talk, and then zoo staff and volunteers will be available to assist the public with the iNaturalist program as well as answer questions.